The Mahindra XUV500 facelift will be launched in India on April 18, 2018. The updated SUV will come with new and improved cosmetic updated and features. Mahindra will be launching the 2018 XUV500 facelift in India on April 18, 2018. The updated model will come with cosmetic updates, new styling and a host of new features as well. Few Mahindra dealers have already started receiving the facelifted XUV500 and upon launch, the SUV will mainly rival the Tata Hexa, along with the likes of the Jeep Compass, Renault Captur. We expect the 2018 Mahindra XUV500 to come with a slightly premium price tag, compared to the outgoing model. 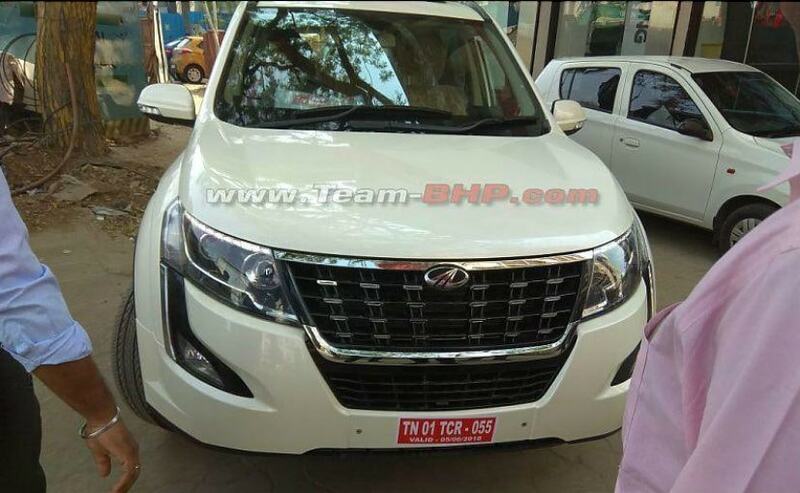 The several spy images we have seen so far reveal that 2018 Mahindra XUV500 comes with a bunch of cosmetic updates like a new radiator grille with chrome inserts and surround and is flanked by a pair of new larger projector headlamps with new LED daytime running lights. The SUV will also get a new front bumper with tear-drop-shaped foglamps with black bezels. The updated XUV500 will also come with new alloys and all-new wraparound taillamps with and individual brake light units below it. The SUV also gets a restyled tailgate with a new chrome slat and larger number plate housing. The updated XUV500 also comes with a new rear bumper and a new roof-mounted spoiler with integrated brake light. The facelifted Mahindra XUV500 will also get a revised cabin with an updated dashboard, which will now feature a new touchscreen infotainment system, restyle centre console, along with new upholstery and interior. We expect the SUV to also come with automatic climate control, reverse parking camera with sensors and rear air-con vents. Mahindra is also likely to offer an improved safety package. Under the hood, the 2018 Mahindra XUV500 facelift will continue with the same 2.2-litre mHawk engine, which is now expected to make more power and torque. The SUV will also come with the existing 2.2-litre mHawk petrol engine that makes 140 bhp and 320 Nm of peak torque. While the diesel motor will get the option of both a manual and an automatic transmission, the petrol is likely to come only with the auto box.